When I was a kid, my action figures of choice were those 8" cloth-covered classics from Mego. I had Superman, Batmn & Robin, Spider-Man, Hulk, Tarzan, Conan and around a dozen others. 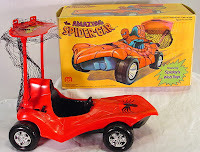 I also had the Batmobile and that weird-looking car for Spider-Man. I didn't have any of the playsets, though, so I took whatever empty boxes and building blocks I could get my hands on to build a small city for my heroes to run around in. One of my early lessons was learning to put away my toys because the city would sprawl out over half the basement, and you literally could not get past the base of the stairs without tripping over part of my city when it was out. As Mego waned as a company, eventually filing for bankruptcy in 1982, my focus shifted to the 3-3/4" lines that became popular in the wake of Star Wars. Luke Skywalker freely mingled with Snake Eyes, Buck Rogers, Bo & Luke Duke, Indiana Jones and the A-Team, and they all frequently used equipment from the incredibly under-appreciated "Adventure People" line. G.I.Joe eventually became the most prominent -- partially due to it's commercial success and longevity -- but I still found an X-Wing parked in my Joe headquarters. Flash forward a decade or two. Companies are able to make more elaborate action figures -- both in terms of sculpting accuracy but also with regard to articulation -- and there's enough of a market that even less popular characters have gotten rendered as toys. (I mean, back in the 1980s I would never have guessed a Moon Knight figure would ever get made! And there've been how many different versions now? That's crazy!) And, although the 3-3/4" size is making a comeback, there have been (and continue to be) any number of great characters coming out in the highly articulated 6" area. What that means is that I can continue to explore mixing those ideas (and newer ones that weren't even around back then!) visually. Once again, I have a cityscape established in my basement populated with Superman, Batman, Spider-Man, the Hulk and Conan. And Hellboy. And Thundarr. And the Goon. And Super Grover. And Lara Croft. And a hundred other action figures of all the other characters rolling around in my head. And the cityscape is built out of various playsets -- far more elaborate ones than were even available from Mego -- instead of just cardboard boxes with "Jail" and "Bank" scrawled on them with crayon. While it's far, far more impressive by any measure now than what it was when I was a kid, I still enjoy exploring the options that are still unattainable through any official channels. Fan fiction for my head, as it were. But between action figures and comic books, I can't keep up. I just don't have the resources to get all the toys I would like, as well as all the comics I'd like. Heck, I can't even get all the comics I like if I ignored the toys altogether! I was never able to pick up those NECA versions of the Teenage Mutant Ninja Turtles. I'm easily a year behind on the Marvel Legends and DC Classics figures. I haven't even tried looking for the recent Ghostbusters or He-Man figures. I'm certain now that I'll miss all of Shocker Toys' excellent looking Indie Comics line of figures. And then Toy Fair comes around, and it's almost impossible to avoid news about it. A Golden Age Daredevil? The Heap? The Phantom? More Ghostbusters? Kamandi?!? All in the same scale/reference as what I've already got? That is just absolutely incredible! And I'm going to miss all of it. The most maddening thing about Toy Fair in recent years is that the economy has meant I've had to cut back on everything. My purchasing power all but flatlined in 2008, and I've had to make some hard decisions about what I can and can't afford. Comics, for me, are more significant and meaningful than toys and my toy budget has been slashed to zero. (And my comics budget ain't that much higher, for that matter!) Ten years ago, I saw what was being shown at Toy Fair and there was some hope that I could acquire some of those awesome looking trinkets. Maybe just one or two figures -- certainly not everything I'd like -- but there was something there. Some level of hope. Something I could look forward to. These days, the reality is that I won't get any of it. Period. No matter how awesome or cool or unique or clever or brilliant I think one of those toys are, it simply will not find it's way into my home. I simply can't afford any of it. It's small and petty. I have a roof over my head, clothes on my back, food in my fridge. I've got a job to go to every day that pays me on a regular basis. There are people in far more dire situations than mine. I'm living comfortably enough and am able to get by without a highly articulated Zorro action figure. But that anticipation, that hope, that I could get one isn't there any longer. And every February, Toy Fair reminds me of that. THAT is why I hate Toy Fair. What's up with NECA and TMNT, I remember some people already mentioned it when I posted about the fair coverage. Nothing that I dug up pointed in that direction, but NECA also hinted they were going to be doing Borderlands and Splinter Cell action figures. Which reminds me that you may not go after comics+figures, but you can go after video games+figures. TMNT is now Nick and no longer Mirage or 4kids so could be a prob for them!